What Cocktail? 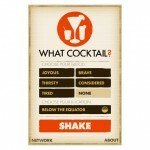 is an iPhone app that helps you choose the right cocktail. Created by Kim and the Flightless team, it’s the result of a lot of research and whole lot of passion for cocktails. In fact most of it was done for this very site. There are a lot of drinks out there. Some outstanding, most terrible. What Cocktail? is about suggesting the right drink for the right time. Sometimes it’s nice not having to choose. What better way than with a beautiful looking app for your iPhone? All the drinks are time honoured classics. No duds. 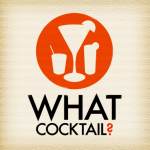 You can find more about this exciting product on the What Cocktail? website.